Bangkok (Thailand) – March 15, 2018 (travelindex.com) – lebua Hotels and Resorts is hosting a grand event celebrating their 12-year partnership with Pernod Ricard. The event marks Mezzaluna’s Michelin Two Star Award and the anniversary of lebua’s successful collaborations with Pernod Ricard including the creation of Flute – A Perrier-Jouët Bar, which brought lebua exclusive vintages of Perrier-Jouët champagne, and last year’s launch of Alfresco 64 – A Chivas Bar, which marked the creation of lebua’s own exclusive whisky blend by Chivas Regal. The event will close with a preview of lebua’s newest additions to The Dome at lebua – the upcoming Japanese restaurant and bar, Sukai Omakase and Bar Sukai. The event will be a celebration, ending at midnight, and will traverse The Dome at lebua beginning with a champagne tasting at Flute and ending at the State Room on the 67th floor, the venue for the upcoming Japanese restaurant and bar. “Pernod Ricard have been amazing partners throughout the years and have been instrumental in building The Dome at lebua into what it is today. We’ve had a number of monumental occasions in collaboration with Pernod Ricard and hope to have many more in the years to come. 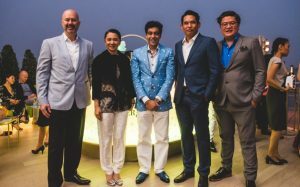 This event is a celebration of everything we have already accomplished and all we have yet to do,” said Deepak Ohri, CEO of lebua Hotels and Resorts. Guests will be invited to join lebua and Pernod Ricard at Flute – A Perrier-Jouët Bar to enjoy a champagne tasting featuring exclusive vintages from Perrier-Jouët to mark Flute’s two-year anniversary. From Flute, guests will move to Alfresco 64 – A Chivas Bar to commemorate Alfresco 64’s first anniversary. The evening will feature premium Chivas Regal whisky and whisky cocktails, a gourmet selection of snacks and music from a live DJ. The piece de resistance of the evening will be the unveiling of the venue for the upcoming Japanese restaurant, Sukai Omakase, the State Room on the 67th floor of lebua’s State Tower. The State Room will be transformed into a nightclub featuring world-class DJs and a premium spirits selection. “Our strong partnership with lebua has resulted in an amazing business expansion on Pernod Ricard brands with a double digit sales growth every year”, said Quentin Job, Managing Director of Pernod Ricard Thailand. The partnership between lebua Hotels and Resorts has been incredibly successful. In the 12 years since the partnership began, the collaboration has made its mark on the Bangkok skyline and resulted in international acclaim following the launch of Flute – A Perrier-Jouët Bar and Alfresco 64 – A Chivas Bar. lebua Hotels and Resorts is a growing international luxury brand that operates distinctive hotels, fine restaurants and bars. Led by visionary CEO Deepak Ohri, Bangkok-based lebua takes a unique approach to hospitality that aspires to tap into a deeper level of exchange with guests to illicit emotional connections. lebua’s award-wining lodging collection includes Bangkok’s best-performing luxury hotels, four boutique hotels in India and an exclusive property in New Zealand. The Dome at lebua, the group’s collection of restaurants and bars atop its Bangkok hotels, include Breeze, Sirocco, Sky Bar, Flûte – A Perrier- Jouët Bar, the signature Mezzaluna restaurant, which was recently awarded two Michelin stars, and the newly launched Alfresco 64 – A Chivas Bar, the highest whisky bar in the world. lebua is currently exploring hotel management contracts in city and resort destinations worldwide. Pernod Ricard is the world’s No 2 in wines and spirits with net sales of €9,010 million in 2016/17. Pernod Ricard holds one of the most prestigious brand portfolios in the sector: Absolut Vodka, Ricard pastis,Ballantine’s, Chivas Regal, Royal Salute and The Glenlivet Scotch whiskies, Jameson Irish whiskey, Martellcognac, Havana Club rum, Beefeater gin, Kahlúa and Malibu liqueurs, Mumm and Perrier Jouët champagnes, as well St.Hugo, Jacob’s Creek, Brancott Estate, Campo Viejo, Graffigna and Kenwood wines. Pernod Ricard Thailand is one of 85 market companies globally and was established in 2002. Pernod Ricard Thailand has been the wine andspirits partner of lebua since 2006, collaborating to create the world’s highest al fresco champagne bar, Flûte – A Perrier-Jouët Bar, and now partnering again on the world’s highest outdoor whisky bar: Alfresco 64 – A Chivas Bar.